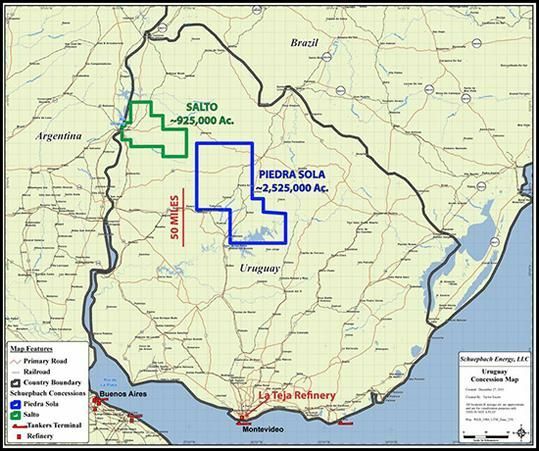 Australia's Petrel Energy has confirmed the conventional oil reservoir potential of the San Gregorio and Cerrezuelo sandstones in Uruguay following detailed analysis of the Cardozo Chico core-hole samples. Petrel said that laboratory testing undertaken by Weatherford in Houston returned excellent permeability and porosity measurements. This conventional potential is in addition to the already identified unconventional potential of the play. However the company noted that while the porosity and permeability measurements are limited and restricted to only one core-hole at this stage, they are nonetheless indicative of excellent reservoir potential. Coupled with the existence of free oil in different formations over much of the Piedra Sola block, the data is highly encouraging. The release from Petrel and from partner and operator Schuepbach Energy International LLC (SEI) said that ”detailed analysis of the Cardozo Chico core-hole samples has further confirmed the significant conventional reservoir potential within the Piedra Sola and very likely deeper Salto concessions. Lab testing undertaken by Weatherford in Houston, show porosities in excess of 20% with measured permeability of 1 to 3 Darcy (1000-3000md) and in excess of 20 Darcy in some isolated samples“. Petrel Energy Managing Director, David Casey said that the exceptional permeability measurements have been surprising and confirm ”exciting conventional potential in addition to the already identified unconventional potential of the play. Many of the key components to a commercial oil system are starting to fall into place earlier than expected“. ”The existence of both Permian and Devonian source rocks, such as the 30 meter thick oil prone Mangrullo Shale, and excellent quality sandstone reservoirs represent significant conventional and unconventional reservoir targets. ”While the porosity and permeability measurements are limited and restricted to only one core-hole at this stage, they are nonetheless indicative of excellent reservoir potential and, coupled with the existence of free oil in different formations over much of the Piedra Sola block, are highly encouraging”.